Locked your keys in the car? What do you do now? 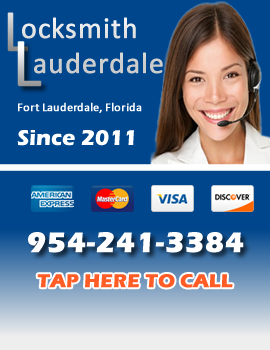 Call Locksmith Fort Lauderdale! Locksmith Fort Lauderdale is the fastest and most affordable in Broward County Florida. We can get to you fast, unlock your car, truck, house or business, make you a new set of keys (if need be) and have you back on your way in no time flat. Every job is different. unlocking a 2006 Toyota is easier than unlocking a 2012 Mercedes Benz. For only $19, our expert locksmith will come to your location and give you firm estimate of how much time and effort it is going to take to get your job done. Most car unlocks run about $35. Some are more depending on the security level of the vehicle. It is impossible for any locksmith to give you an exact price over the phone. Call Locksmith Fort Lauderdale today to get a technician dispatched to your location fast. If your job is an emergency, you want someone there fast. Lucky for you, we have several locksmiths out and about in Fort Lauderdale and the surrounding area, 24 hours a day, 7 days a week. Out Broward County locksmiths are dispatched vis GPS. Once you give our dispatcher your location, they will check the computer to see where the closest locksmith is to you and dispatch them. We normally can get to you in less than 15 minutes. (sometimes longer during spring break). We are open 24 hours, 7 days a week. Our locksmiths are strictly mobile. All work is performed out of our well equipped locksmith vehicles. If you need an emergency locksmith in Fort Lauderdale, Call us now. Locksmith Fort Lauderdale is much more than an emergency unlock service. We can help you with all types of locksmith services in Fort Lauderdale. From rekeying locks to installing doors, we can handle any type of locksmith job you send out way.